This entry was posted in Batteries, Teardowns, Uncategorized and tagged 0x36720414, 0xffffffff, battery fuel gauge, battery gas gauge, bq 7541, bq27541, bq27541 iphone, bq7541, disassemble, disassembly, full access, iphone, iphone 4, iphone 4 battery pinout, iphone 4s, iphone 4s battery pinout, iphone battery, iphone battery pinout, iphone battery teardown, teardown, unseal, unseal key by ginbot86. Bookmark the permalink. hello, what do you think about put 2 batteries in parallel into an iphone 4s? do you think that the bq27541 it has to be reprogramed? i mean to allow more (the double) current charging capability? If you mean putting two iPhone 4 cells in parallel with one fuel gauge, you will certainly need to have a means of reprogramming the bq27541 to recognize the capacity of the new battery. Although it can increase your battery capacity, the fuel gauge would likely prevent you from seeing the sort of performance gains that you are expecting from doubling up on battery capacity. Also, it probably won’t allow you to halve charging time or double the charging current; if anything, it would just double the amount of time that your phone would need to fully charge. Hello, I have a question regarding this board inside the the 4S battery, When a mesure the voltage directly on the battery contacts i find 4.3v but nothing 0v between -Grey and +Red ! Idis you think is a dead fuse cause ? I see on the top a CMS look like a resistor and on the back side much more components but I don’t know what is the protection ones ! Please can you tell me some indication ??? Hello, great work. I was trying to use laptop battery cell with the protection circuit of the iPhone 4s cause its battery is almost dead (it wasn’t original), but the phone didn’t work. What happens if I disconnect the battery from the circuit? and is it possible to use a good battery with the protection circuit? Do I have to reprogram it? thanks in advance. If you disconnect the battery, you might need to re-activate the protection circuitry. Briefly short the Pack- and Cell- terminals together, and it should reset the protection circuit. You can use another cell, but it will not operate properly without being reprogrammed with TI’s software. I have thought of making my own tool so that a $50-200 tool wouldn’t need to be used, but the complexities of TI’s Impedance Track algorithm would prevent me from doing that easily. I would like to share my experience with everyone which might help. I did replace iPhone 4s battery with a laptop battery and thanks to your advice, it worked. By the way we would love to see your work in video, If you have a YouTube channel or something like that please share it with us. The Pack and Cell terminals refer to the contacts on the battery’s circuit board. The Cell terminals are directly connected to the Li-ion cell itself (and are located directly on the PCB itself), and the Pack terminals are on the connector that plugs into the phone’s motherboard. Measure the voltage across the Pack+/- pins. If you don’t see the battery voltage on them, briefly short the Pack- and Cell- terminals with a small piece of wire. It is possible that the protection circuit was activated, but didn’t automatically reset itself. I find that the TP40xx charger ICs might not always be able to “wake” a Li-ion protection circuit. The protection that the TP4058 offers is only for the charger, not the battery itself. Although you can charge (not discharge) the cell directly and bypass the protection, it puts you at risk of a fire should something go wrong. Also, if the protection circuit refuses to function even if the cell itself is fully charged, then the battery pack is unsafe to use until the protection circuit (or the whole battery pack) is replaced. Hello Jason, Congratulations for your job on iPhone 4/4S battery. I would like to know if the APN is really stored in the flash memory of the BQ27541. Normally it should be but I do not know where. I’ve been doing some quick tests on my collection of iPhone batteries, and none of them store the APN in the Data Flash (I presume you mean the ones like 616-0512 for the iPhone 4 battery?). They do contain serial numbers, however. When you change the original battery of an iPhone 4S with a battery that has an APN older than the one of the original battery (for example you change a 4S battery with APN : 616-0582 by a new battery with APN : 616-0579) you will have an error #29 when you will boot the iPhone and it will be impossible to restore the iPhone on iTunes. Only solution to restore will be to come back to original battery. So clearly IOs operating system is checking the version of the battery. For me it was the APN but maybe this is a serial number… I have made some reading of the Bq27541 using an evaluation board EV2300 from TI and I cannot see where the APN or Serial number is stored. Do you have an idea where it could be stored ? The serial numbers are stored in the System Data section of the Data Flash. Under Manufacturer Info, Block A is some sort of 7-byte serial number (like 4D E0 FD 3F 10 42 48), and Block B is the ASCII serial number that iOS uses (like ST135113240UFT1420), as far as I know. The iPhone 5 has another sort of part number(?) in Block C (like 069782306). The iPhone 6 and newer has a different serial numbering system, as they include some sort of “system pairing” feature that I am not very familiar with at the moment. Do you have any idea to make the relation ship between Serial number and APN ? On an original iPhone 4S battery serial number is in hexadecimal : 89 81 2D 3F 8F 42 48. APN number is 616-0581. Device name is bq27541. On a “probably non-original” iPhone 4S Battery, I did not succeed to read the serial number…. I read the device name and it is SH36600. I guess my problem to read the serial number comes from the fact that the chip is not a BQ/TI chip but an equivalent. The footprint/casing of the IC is the same as a BQ/TI 27541. Any idea of what manufacturer is behind this reference SH36600 ? As far as I know, the APN is fixed, and only differs between cell manufacturers. As for the battery you mentioned, you said you have the EV2300 on hand. 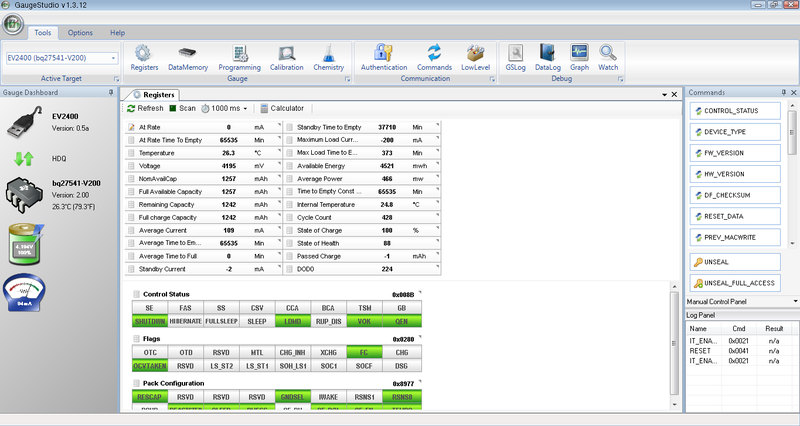 Do you have any screenshots of the TI software that shows the data you’re reading from the battery? Do you have an email address to send you my screen shot ? I have more than 10 to send you.. by email it will be more convenient.. possible ? I can be reached at ginbot86@gmail.com. We can continue our discussion by email after that. Any ideas what the error code -4 means? I assume the iPhone was unable to update to the firmware of the gas guage? Unfortunately, I do not know the answer to that. My focus has been the batteries themselves as I do not own an iOS device myself. I’d be surprised if the phone updated the gas gauge’s firmware as it would take over 10 minutes to do over the HDQ interface. Pingback: Charging, Batteries, HDQ/SWI - iPhones/iPads How does it work? Man you’re a life saver! nice tutorial — The restarting of protection board works! Now the only problem is how to wire the damn connector lol (iphone 5 batt doesn’t have expose terminals). I’ve yet to discern how to recover the connections for iPhone 5 and later batteries since the flexible cable is built into the same circuit board as the protection/gauge. It’s really annoying!